The Competition Clutch Stage 3 (Street/Strip Series 2600) Clutch Kit's segmented Ceramic material (available with sprung or rigid disc) is the ultimate street/strip clutch combination available on the market. 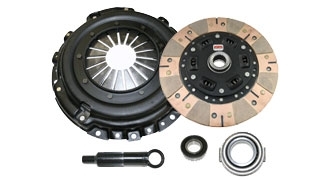 This clutch kit is suited for up to 150% increase in torque capacity, compared to the Stage 2 clutch kit. This Stage 3 kit provides quick but smooth engagement points, perfect for those needing to quickly shift at high RPM's (for race/track applications).